This is a discussion added to the overall thoughts in Parts One through Four. before the Battle of Armageddon. Much of what I will discuss below will be of a general nature. Please do not believe that you, if you are a born again Christians, must be a victim of all the evils of either the Hidden Hand (Nicolaitans) or the rebellious sheeple (Laodiceans). The following is meant to paint the total picture, as I see it, of the drama now working itself out in humanity at large. With the fascination with many predictions of doom and gloom in 2012, and with the rumblings in Iran and Syria as I write, we must assume that, as we said in Part Two of this study, war is immanent, and it will serve well in the plot to reduce the world's population. One of these days, some war will result in a shocking over kill event, and the world will cry out for a peace maker, a Messiah, but they will not want Jesus Christ, THE Messiah. Nicolaitan-- Above the people, master the people, or rule the people. Laodicean-- Rule OF the people, BY the people, and FOR the people, Anarchy, glibly called Democracy. Democracy ALWAYS COMES TO THIS-- A SELF-DESTRUCTIVE WAR BETWEEN THE ELITE AND THE MASSES. Greece is now going through this class struggle, Spain is possibly looking at a major rupture as the Catalan people demand to be independent. The USA is now shattering socially, morally, and geographically, and class struggle is actually being encouraged by its African American President. The following is the account, in the Bible book of The Revelation, from Christ to the Apostle John, the last book in the Bible. There are seven churches addressed, and they were all very real churches in about 70 AD. They also represent seven kinds of churches in Christendom in the End Times, which is the overall theme of this book. You may be able to identify most of the church types from your own sojourn in this age. I want you to see the characteristics of the Nicolaitans and the Laodiceans. They are two forces at war with each other, and Christ talks about them in this revelation. Though this is a discussion of war in the Lord's Church, this passage also gives a very graphic picture of the two forces that bring us to the threshold of the last act in human history. These same two forces are now manifesting in social and political life in almost every nation on earth. You need to understand that in the Bible text we started with, there is no indication that the Laodicians would not be given Strong Delusion along with the Nicolaitans. For this reason, both parties are deluded, both are addicted to acquisition and greed, and both fully believe they will win the war against the other. Since the White Race is not the center of attention in the End Times, I have to wonder if the destiny of the White Race is to largely self-destruct. The exception is Gog and Magog, Russia, who figures into the very end game of prophecy, even raising an army against Christ at the end of the one thousand year Messianic reign. They are finally totally destroyed then. The rest of the White Race is toast. Even Iran, the ongoing boogie man as I write, has a slightly better destiny than the USA, that is, in Bible prophecy. The above Bible text above the Laodiceans are said to be neither hot nor cold. This is the age we now live in, and we can see that Christendom worldwide has been spewed (vomited), as Christ predicted. Alleged churches are full of greed, wickedness, and they are nearly totally raped of their old biblical heritage by the modern gurus of the mega churches. So, if you keep this in mind, and with God's divine guidance, you can step back, watch the mob struggle one against the other, and you can see trends. Once you identify a trend by using the Word of God, you can set in motion a strategy for your family and your local church. If you are in a mega church, forget it-- money and power are THE foundation of the mega church. They are literally rubbish right now, doomed, as we arrive at the end of the Church Age. So , the nature of two forces is now very busy-- Nicolaitan and Laodicean-- lust for money, and lust for power-- oppression from above and rebellion of the sheeple. The rulers above are trying to take control of the lives of all men, and the sheeple below are trying to throw off this tyranny. In the process these two entities are at virtual war as rebellion is met with toys to bribe the sheeple or weapons to intimidate them. Regulations are also used to herd the Laodiceans into a submissive mob. The riots around the world are almost all related to income, taxes, food prices, and getting cheaper stuff for amusement purposes. One great distraction to unite the Laodiceans and cause them not to detect the Nicolaitan Hidden Hand at work, is the stampede. Let us talk about that. In the days of the cattle drives in the late 1800s, from south Texas to the northern states and Canada-- the most deadly and frightening risk in moving cattle to market was the stampede. The cowboys had to stop it or lose the cattleman's fortune. If they let the cattle run and run without stopping the stampede, the cattle lost weight and had to graze longer the next day. 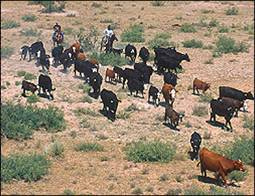 An experienced trail boss, at the orders of the owner himself, would intentionally move the cattle slow so that they could graze much of the day. The greener grass farther north actually added weight to the Texas cattle that might have just come through a lean winter in south Texas. The cattle are content because they are driven slow enough so that they have a full belly, and they have no feeling that they are being abused and being prepared to be hamburger. When the cattle stand up in the middle of the night, a stampede is about to happen. That is what terrified the night watch cowboy in the cattle drive days of Texas. When he sensed the cattle were restless, the cowboy would start singing tunes that were called the "cowboy's lullaby." Almost all cowboys were religious, and they would "get religion" and sing "Amazing Grace" and "Power in the Blood" as well. Anything that worked. They sang sweet and tender, and if the cattle liked the cowboy's pretty songs, they might not notice the thunder in the distance. The clammy darkness of a moonless night, especially as the lightning and thunder of an approaching storm came closer and closer and the barometric pressure dropped, played havoc on the cattle's senses. The snap of a stick, or a the cough of a sleeping cowboy in the night could start a stampede. Muggy weather, unfamiliar surroundings, or the howl of a wolf could add to the panic of the steers. During a stampede, some cattle fell in the mindless frenzy and were killed, and even cowboys were killed because they ran their horses so hard in the dark night and took terrible risks. To just let the cattle run wild until they tired out meant that for the next day, and maybe another, the cowboys would all scatter across the prairie for miles in all directions trying to find the whole herd. So, the cowboy wanted to stop the stampede fast, and he took lots of risks doing it. By the early 1900s there were mounds of rocks from Brownsville, Texas to Cheyenne, Wyoming where cowboys fell trying to turn a stampede, and their horse fell in front of the herd. When the stampede actually began, the cowboy had a "quirt" like a short whip made of woven leather. He snapped it in front of the cattle as they ran wild. This would not stop them, but it would "turn the herd" eventually. The cowboy would also shoot his six shooter in front of the herd to frighten them and to turn the herd. He would never start shooting steers though. The cowboys knew that eventually, if the herd did not run over a cliff, they could turn them and calm them all down again. Once the cattle stampede turned, though they ran and ran, they would eventually turn into a mill, that is, if the cowboys did their work well. This meant all the cattle would run in a big circle. This gave the cattle the sensation that they were running free, when in fact they were under total control. This slowed the stampede, and let the cattle run in circles until exhausted. The danger of a mill was to keep it from getting too tight when the cattle would trample the ones in the center of the mill. Eventually, they stopped, grazed a while, and lay down to sleep again until dawn. If you miss the point of this real life account, you are brain dead. Virtually every aspect of this story has an application to the tactics of the Nicotaitans as they seek to herd the Laodiceans along. But, can you see the application to World War III and our frightening economic chaos worldwide? The stampede is just beginning. The Nicolaitans are the cowboys, and we Laodicaens are the cattle. They will not kill us, but they will turn us into a mill until we go to sleep again. The masses and asses are standing in the night snorting and blowing. There are snorts from Occupy, snorts from the Tea Party, snorts from radio talk show gurus, and even snorts from hundreds of church houses. The Nicolaitans are singing sweet songs of "change and hope" to the Laodiceans. Party politics is set aside eventually, and the Nicolaitans all join forces world wide to try to prevent the stampede. All that is needed if for someone on high to cough too loud or step on a dead stick, and the stampede is off. Which cattle survived the stampede best? Answer-- The mavericks that hid deep in brushy country south of San Antonio, just before round up. They went unnoticed or were simply too much trouble to find. Will you join the stampede, or will you head for cover and wait it out? Think "occupy," think "Arab spring." Think Anonymous..... What is their destiny? Who is really in charge? Who is out yonder in the Brushy Country or camping next to a billabong in the outback? What is the final end of a cattle drive? Answer: The bologna factory in Chicago. Here is a classic form of herding of the sheeple..... Are you a victim? An article at this journal on stampedes by a Black journalist in Indianapolis. Mike Remey discusses stampedes as weapons, and this is a rare observation and a true one. Must read. Psalms 141:10 Let the wicked fall into their own nets, whilst that I withal escape. 1. How are government regulations herding us? Change light bulbs, whisper only politically correct platitudes. Guns kill people. 2. How is the medical world and Big Pharma herding us? Staten drugs, flu shots, vaccinations-- 58 doses of them. 3. What myths from politicians might we believe? Change and hope, save the Constitution, poverty is the fault of the rich. 4. Do I have a source of good skeptical friends, or am I part of the gullible mob? 5. Do I know enough past world history and biblical history to diagnose this sick world and avoid becoming part of the problem instead of being part of the solution? 6. Do I read anything these days that illuminates this scene, or am I feasting on panic mongers and corrupted media news? Both the Nidolaitans and the Laodiceans have their favorite myths. Do you believe things that totally violate the Word of God? Remember, we learned above that God HATES the Nicolaitans, and he VOMITS out the Laodiceans. Are you a Philadelphian? Are you willing to be peculiar to both of these world forces of mad man? WHERE WILL THE STAMPEDE END? The New World Order Eugenics perpetrators of this ongoing holocaust imagine they are on their way to a Utopia where the world will have abundance for the few left. They also imagine that they will be the Great Nanny of the masses and asses beneath them. God is not amused by men who try to climb into his throne and be, de facto, the god of the universe, especially if they step on the heads of his children on their way up. So, God will send Jesus Christ, BEFORE HIS KINGDOM REIGN, to invite the world elite above to a battle where they will self-destruct. This invitation by Christ will not be openly delivered to them personally-- it will be delivered by Satan through the Antichrist and the false prophet who have Christ's permission to deceive all of humanity. The leaders of all nations will become totally deluded until they think they can win the last great war. They will come from the East, Russia, and virtually all nations to kill one another, and they will all think they can win. It sounds crazy to people now who think of themselves as cautious and wise, but the world has never seen "strong delusion" like this before. It is a case of universal mind control by God himself, and it is not a good thing-- if is deadly. Why would God do this? Answer: The whole world has blasphemed his name, they have rejected the Gospel, and they have NO thankfulness for what God has given them. The US Military plays with mind control weapons, but they are about to be the target of the ultimate weapon-- the power of God to control minds so that they believe Satan. Deluded power mongers cannot tolerate sharing their mongrel kingdom, and God, in the Bible, describes this final mother of all wars. 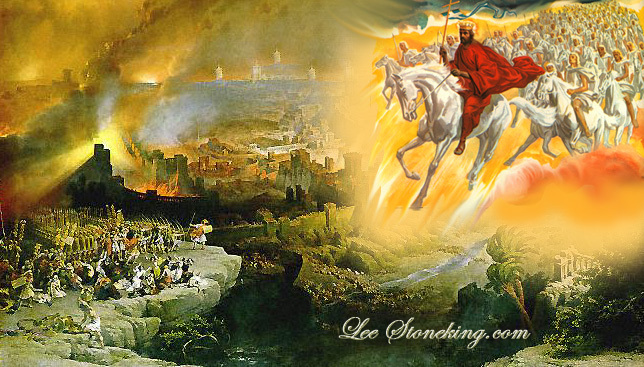 While the saints are in Heaven preparing to return with Christ, the armies of the earth gather toward Jerusalem. They are inspired and led by Satan, the Antichrist and False prophet who have deceived the nations. The Bible prophet Joel writes about this day as the nations gather. As the armies of the earth gather around the land of Israel, and approach the hills around the valley of Megiddo, they prepare for battle against God Almighty, deceived by Satan, the Antichrist (The Beast) and the False Prophet. Terrified, Israel calls out for redemption and salvation to Christ, their Messiah. It is at this point of national conversion that Christ comes to the rescue of a repentant Israel. If you are one of the mass who stampede, you now know how it will end-- the divine slaughter house. As with long ago in cattle drives from Texas to Kansas, some stampedes ended when the cattle smelled water and stampeded to a river, only to find they were on a cliff over a river. They could not stop themselves and went over the edge to drown. Next, we discuss a better ending. The ongoing escalation economic chaos, along with the all pervasive One World obsession in the heart of national leaders and academics, AND the pounding persistence of the major media to comply with the Hidden Hand will temp us to believe that nothing can stop the juggernaut on its way to squash us all into the pavement as it passes on. But, there IS a happy ending. No man on earth is clever enough and rich enough to outsmart God, nor will they buy him off. [ Did you ever wonder what a juggernaut is? Watch this old video of one. I think of the media when I see the musicians playing the cymbals. The end of the age we are now entering will find that God's people will live in a world where everything is holy, even the cooking pots, and every horse will have "holiness to the Lord" engraved in its bridle. What a reward for those who suffered through the Last Days. And, the Eugenists will be the ones to die horrible deaths. If this seems like a fairy tale, it is because you are not born again by faith in Jesus Christ. Thus, you watch these events like they are a horror movie, somehow believing that those magic words "THE END" will suddenly appear on the screen, and you will walk out, go have a beer, and laugh it all off. Deluded-- you stand watching the final act of human history, an act that God predicted 2500 years ago, and you have a dumb stare on your face. Pity you my friend. We need to review the nations involved in the End Times. Israel was prophesied to be restored to its land clear back at the time it went into captivity about 500 BC. I will not take the time here to review all the major and minor prophets who spoke about the return. Only a flaming Covenant theologian would try to prove that Israel was not to return to the land. Thus, Israel became a nation again in 1948 about 2500 years after being taken into Babylon and Syria in captivity. The return of Israel started a process of shifting of world national relationships that is almost complete and ready for the Last Days of the Bible. Kansas will not be the center of the world much longer. The nations of the earth use the US dollar, and the US throws its weight around and demands that smaller nations comply with all manner of US notions of what constitutes fairness and safety. Europe is in complicity with the USA in this pattern. But, once the US dollar devalues, the world will flee from it, and the US economy will crash fast. This is in its beginning stages as I write. Asian nations are now using each other's currencies in trade while they leave the use of the almighty dollar. This process will result in the whole world turning against the USA. Many national leaders around the world are fed up with the US bankers and institutions which loan money and then take them hostage. When they rebel, the CIA goes into these nations and destabilizes them and even assassinates their leaders. There is a reservoir of hate around the world for the USA. God could also add a natural disaster great enough to virtually shut down the USA in minutes. An asteroid-- we are told that one is on the way from the other side of the sun. It will not be seen until maybe eight hours before it rushes by the sun, and then past the earth. Or, a solar flare of the X-20 magnitude would trash all technology, especially if a earth's magnetic field collapsed at the same time. Evolutionists claim that these come only every 60,000 years. An X-12 solar flare hit the earth in 1889, and it loaded telegraph wires so much that many of they melted down. Consider transistors and our modern AC Power grid being turned to sand. The biblical calendar would tell us that such events could happen at any time. The fact that scientists are chattering about this and speculating as to what the USA must do to "get ready" tells me they may know more than they are telling us. Preterists try to make Gog and Magog into some obscure nation between Russia and Israel. The problem is, Turkey and other nations in that area are mentioned with other names in Bible history and prophecy. Gog and Magog have been known for centuries to be the northern empire of the End Times. Moscow is on the very same longitude as Jerusalem. Russia is clearly the nation being spoken of in Ezekiel 38. Bible teachers see this as an invasion to conquer Israel from the beginning of the process. I personally have come to see a problem with this assumption. Verse 7 above says, "be thou a guard unto them." Guard whom? Perhaps the other nations coming down to Israel, but I know from a contact in Russia that Russia, Israel, and China have a mutual defense alliance signed, and it was a result of NATO clandestinely threatening to attack Israel the same way NATO did Bosnia. Recently, China and Israel have been cutting deals in trade, including arms deals, and Russia is strangely silent in recent years on the Israeli / Arab troubles. 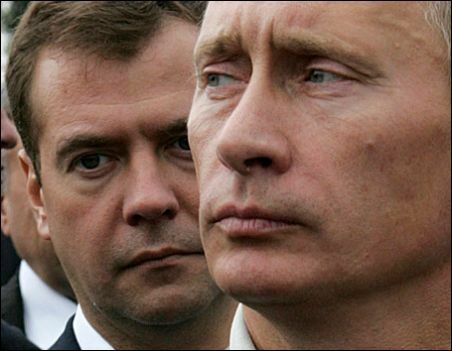 I have come to believe that Russia starts out south with the intention of defending Israel. Verse 10 indicates that after coming like a storm to defend Israel, Russia realizes what a plum they would have if they simply took possession of Israel, and they try to do so. Verse 13 above indicates that Europe calls Russia up on their behavior, but they do nothing to stop the invasion. It is glaringly obvious that the USA is totally unable to either defend Israel nor even question Russia. This is a blatant clue by God that the USA is not in the picture of world events, nor is the USA available to help Israel. With the alliance now in place, and with back room relations with Russia in a positive posture, and if the USA were to collapse and the dollar devalue to rubbish, Israel would have few if any friends to defend her. I personally believe that when God tells Gog and Magog to be a guard to Israel, they are just that for a number of years, and they are the force that keeps Israel from being totally destroyed. This may even include restraining the Antichrist himself, for we read in Daniel that the Antichrist, at least twice, is attacked from the north. We are, it seems to me, VERY near this point, and I assume that predictions of US economic crisis are upon us now, for our national debt is presently a terminal suicide process that none of the financial gurus can stop. We are told that if the dollar collapses the whole world economy will be destroyed. This is absolutely not true. Only a fool would believe it. When the strongest monetary system is destroyed, according to the lessons of history, other monetary systems grow stronger and jump up in value. To Bible believers who are literal about prophetic events these should be very exciting days. To Covenant and Reformed people who play tricks with literal prophetic Bible passages, I suspect these are ho hum days. To you I suggest that you bookmark this page-- your domini will never admit to these trends and events, even as they happen. You will NEED biblical literalists to show you the way. I will be here, and I will be happy to give you a crash course in great expectations. Question: Does God have any reason to deliver you from the Great Tribulation to come? God will NOT help those who bank on anything they have invented. IF THIS IS BECOMING TOO TERRIFYING TO CONSIDER, GO HERE. If you are a Bible believer God has other plans for you. This chart will help you understand the context of all Bible prophecy discussions here. Questions you may have from reading this article will very likely be dealt with in this section. Please feel free to copy, post, and redistribute this article. I do ask that you add a credit and a link to my journal. Also, you may not change it other than omit the advertising. If you include the photos, you MUST add the photo credits above.